Run an AppleScript when the power button is pressed. Is there a better alternative to PowerBlock? Is PowerBlock really the best app in System category? Will PowerBlock work good on macOS 10.13.4? PowerBlock intercepts presses of the power button and optionally runs an AppleScript. This is handy on the MacBook Air where the power button is now a key on the keyboard and can be accidentally pressed. By running an AppleScript when the power button is pressed, you can setup your system to immediately shutdown, restart, sleep, or eject a DVD. This is great for headless servers. Known Limitations: PowerBlock does NOT prevent a hard shutdown if you hold the power button for more than 4 seconds. 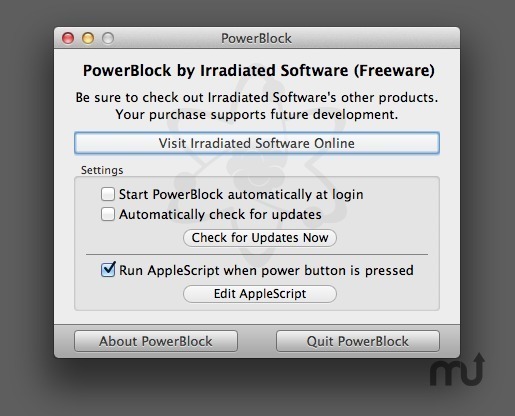 Powerblock is not compatible with OS X 10.9 due to changes in the power system. IMPROVED: Added more examples to the AppleScript. IMPROVED: Inform user when there's an error in the AppleScript. IMPROVED: Hide the splash screen by checking "Hide" in System Preferences > Users & Groups > Login Items. FIXED: Start at Login wasn't always working.